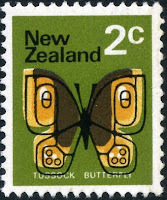 Virtual New Zealand Stamps: 1970 Pictorial / Definitives - Part Three. 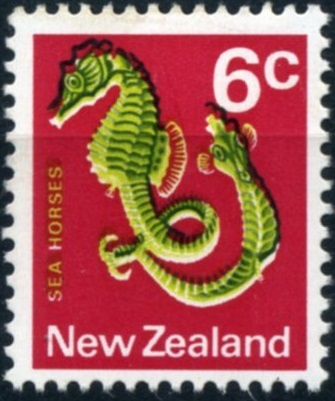 Back to 1967 - 1968 Pictorial Definitives. 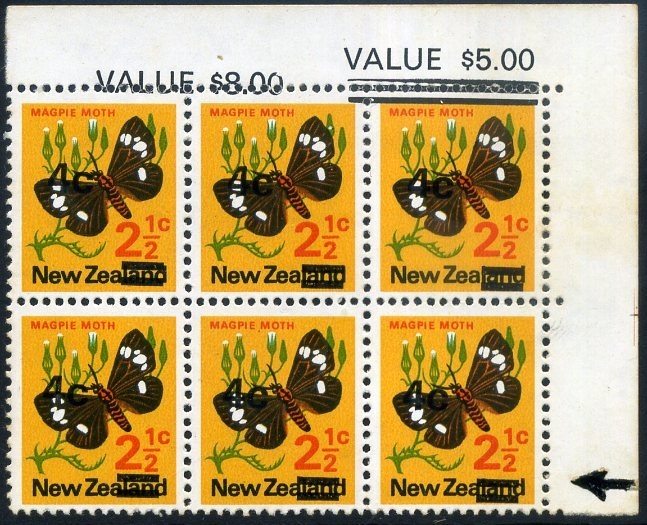 Forward to 1975 Decimal Pictorials. 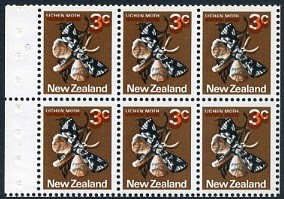 We found a large number of flaws in this issue, particularly through the lower values. This page displays many of them but in the end it came down to the question of just how many examples do we really want to crowd onto one page. 1970 Definitive / Pictorials - Part One. 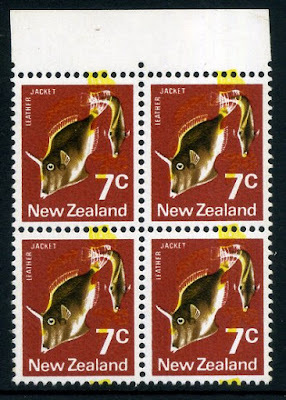 Overview of the 7 issues of this series of stamps. 1970 Definitive / Pictorials - Part Two. Looking at the designs and subjects of these stamps. 1970 Definitive / Pictorials - Part Three. 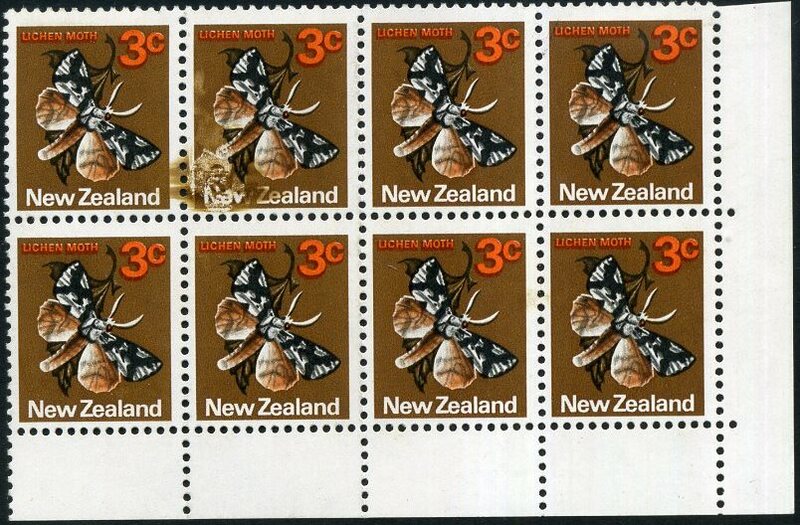 A collection of flaws & errors from the low values. A collection of flaws & errors from the large values. 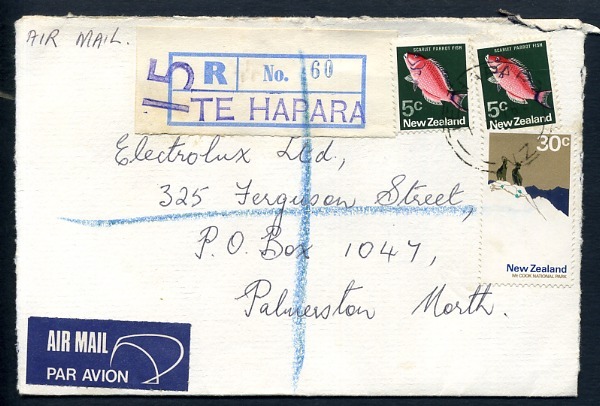 Some other items of interest including a collection of courier tags. Below, on this page, are flaws and errors found in the lower values while Part Four has a collection of similar flaws found in the higher values. ½c - Glade Copper Butterfly. 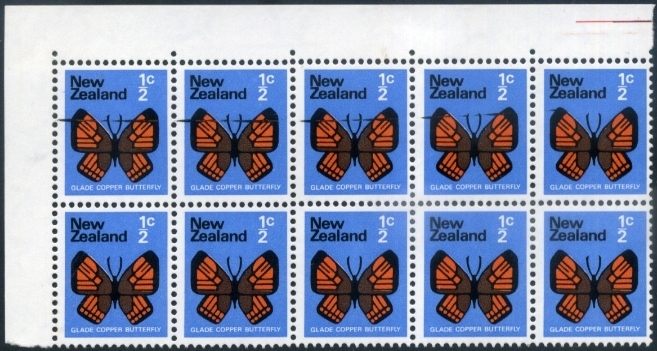 Left-hand Stamp - 1970 Pictorial ½c Glade Copper Butterfly with a minor movement of the black showing an orange line on lower right wing and white line in top left wing. 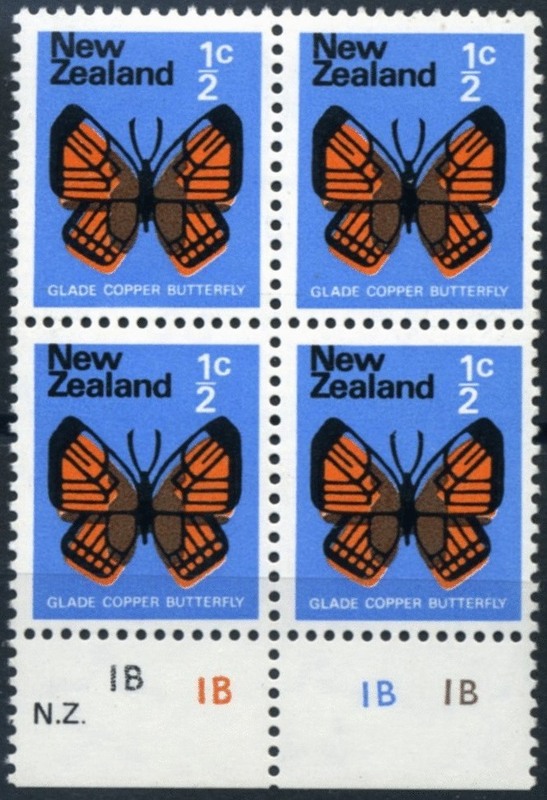 Right-hand Stamp - 1970 Pictorial ½c Glad Copper Butterfly with all colours offset on back. 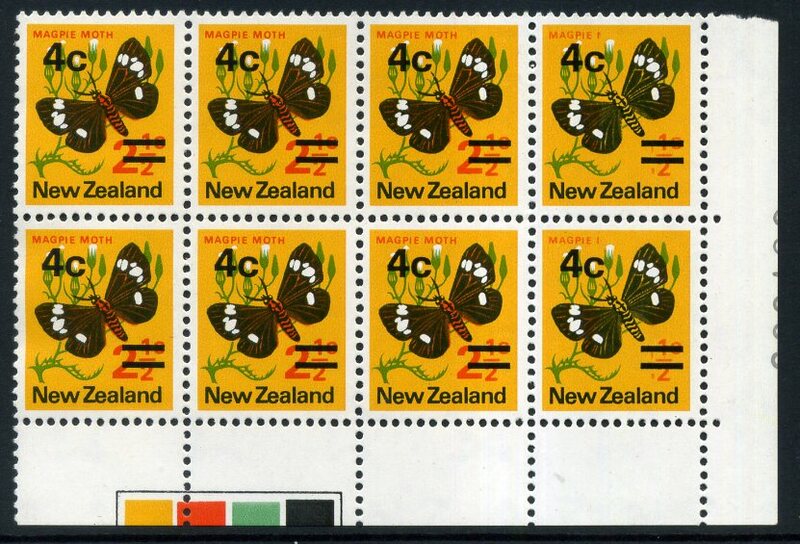 This is almost a complete offset of the whole design, a very good example of an offset back. 1970 Pictorial ½c Glade Copper Butterfly corner selvage block of 10. The top 5 stamps show black colour drag mark, best seen near the top of the butterfly's wings as a horizontal black line. 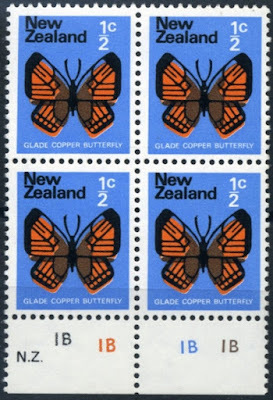 1970 Pictorial ½c Glade Copper Butterfly lower selvage block of 4 with a black shift. 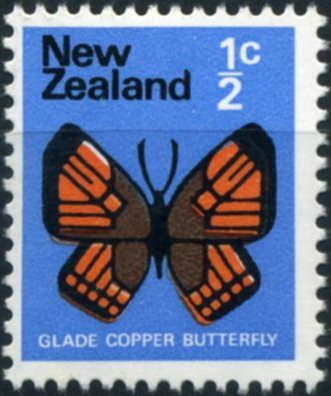 Now the butterfly's skeleton appears to have moved upwards showing a gap of orange at the bottom and covering the blue at the top. 1c - Red Admiral Butterfly. 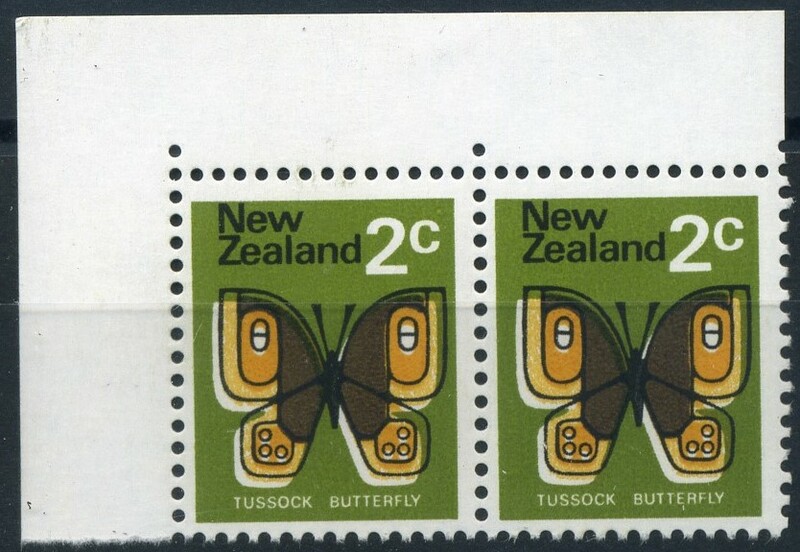 1970 Pictorial 1c Red Admiral Butterfly, two examples of genuine used errors of black downward colour shifts. 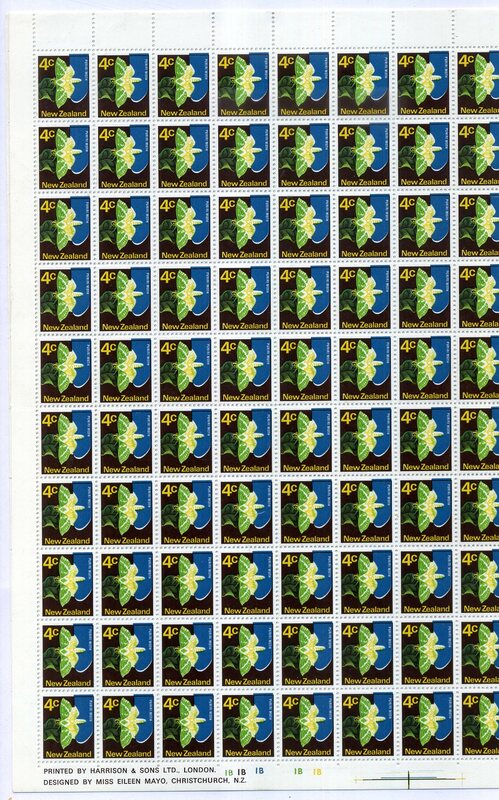 The main reason I've included two of these is because I think used flaw are rather special as they have successfully past completely through the postal system. Left-hand stamp - 1970 Pictorials 1c Red Admiral Butterfly with the red colour omitted. Right-hand stamp - 1970 Pictorials 1c Red Admiral Butterfly with black offset on back. 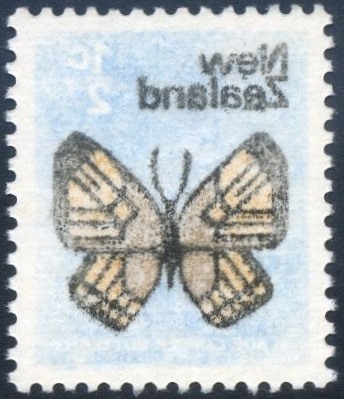 Two used stamps with flaws in the blue (spots on the lower wings). 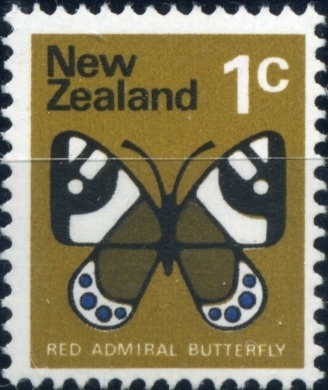 Left-hand stamp - 1970 Pictorial 1c Red Admiral Butterfly booklet single with the 8 blue, wing dots completely omitted. 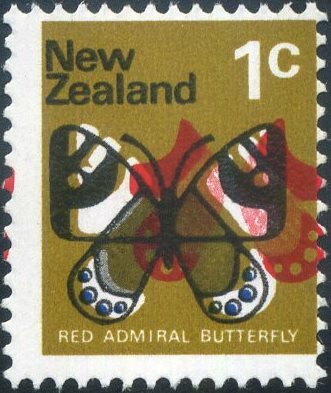 Right-hand stamp - 1970 Pictorial 1c red Admiral Butterfly, with the blue dots suffering a major shift sideways 2mm to right and have moved completely off the butterfly wing. 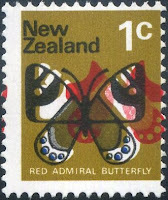 1970 Pictorial 1c Red Admiral Butterfly, a treble error example where we have a perf shift, a black shifted left and a red 5mm shift to right. It is very rare to find an example such as this and as I have mentioned elsewhere in this blog I wonder if in fact such examples came from the printer's waste trial sheets while he was setting up his press. 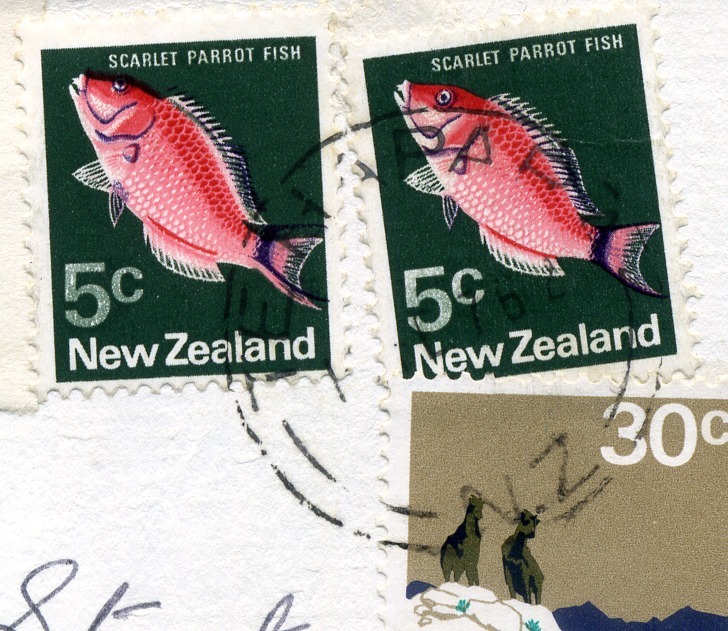 My one problem with this theory is the fact that the stamp had been perforated. 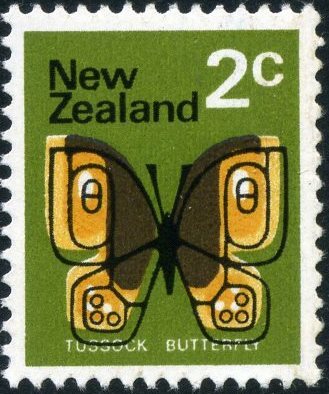 Left hand stamp - 1970 Pictorial 2c Tussock Butterfly with a black colour shift downwards and to the right. Right hand stamp - 1970 Pictorial 2c Tussock Butterfly with the green background colour shifted down and to the left. 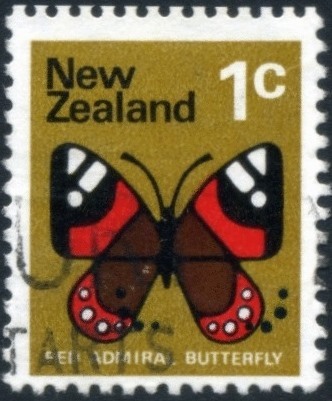 Left hand stamp - 1970 Pictorial 2c Tussock Butterfly black omitted including details in the design and the country name. 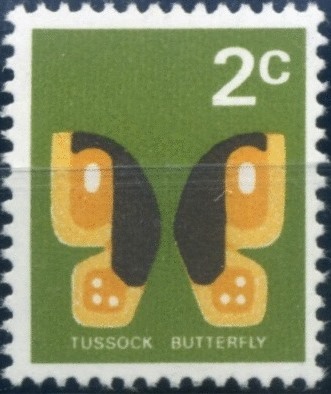 Actually when you look closely you can see the whole butterflies' body is missing. 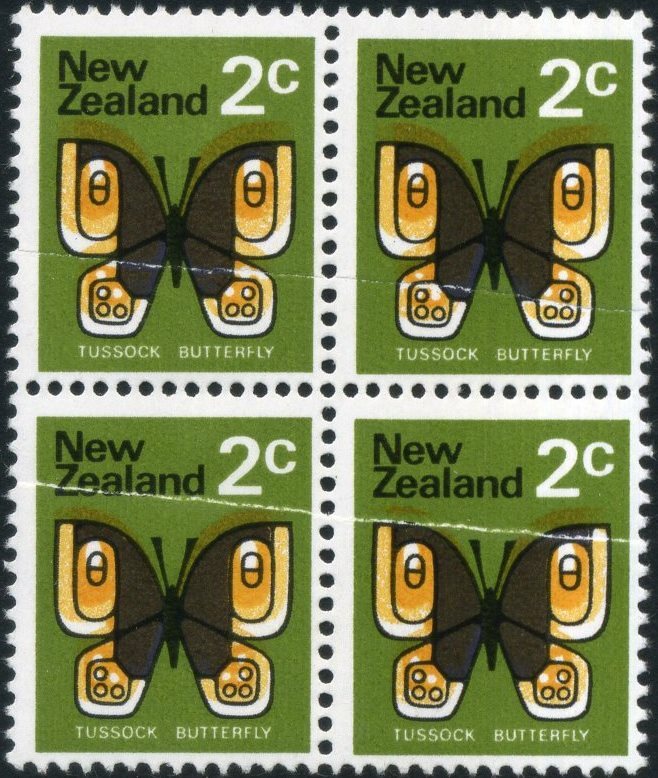 Right hand stamp - 1970 Pictorial 2c Tussock Butterfly, where creases in the paper caused either before or during printing lead to various colour shifts in the final result. 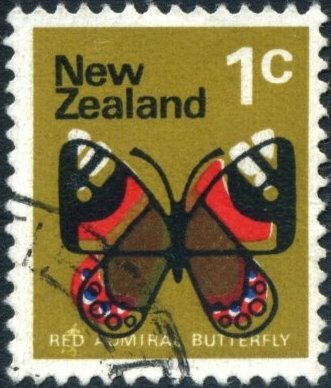 While this example is an over/print the actual flaw occurred in the original stamp. 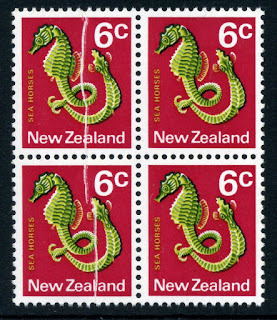 The reds fades out towards the right side of this block of eight stamps. 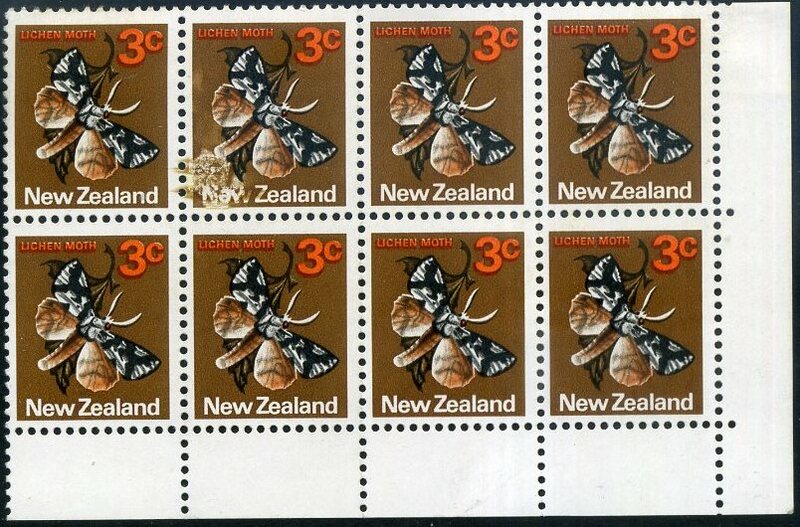 1970 Pictorial 3c Lichen Moth with an Orange shift down. 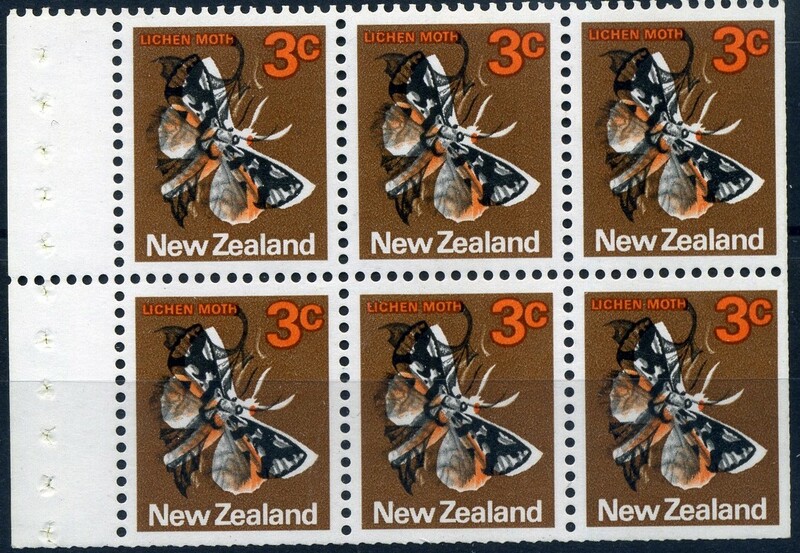 Left hand block - 1970 Pictorial 3c Lichen Moth right hand selvage block of six where middle pair has received some kind of black & orange over printed flaw. 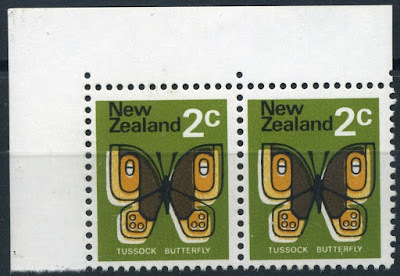 At first I thought it might have been caused by the sheet passing through the machine twice but the upper and lower pair have not been effected in the same way. 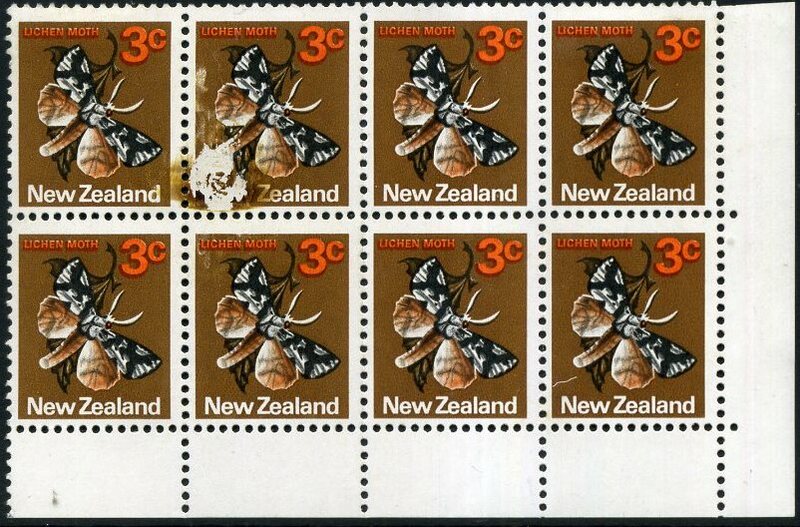 Right hand block - 1970 Pictorial 3c Lichen Moth with an orange shift upwards. 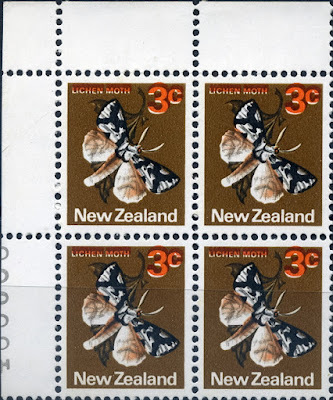 1970 Pictorials 3c Lichen Moth booklet pane of 6 with a left colour shift of the black that creates a stunning white ghost or shadow Moth. 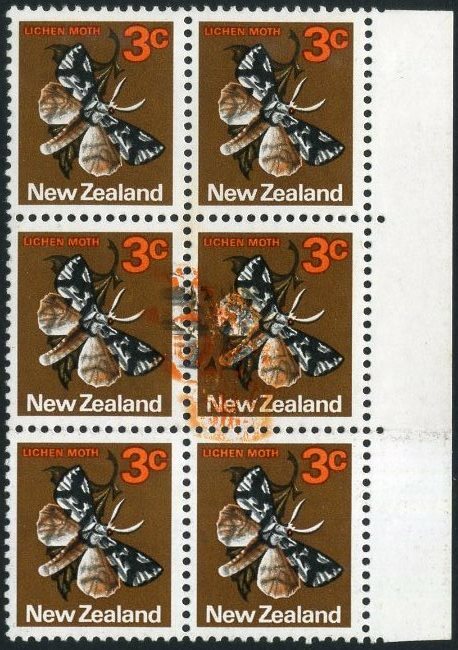 1970 Pictorials 3c Lichen Moth Plate Block of 10, with a perforation shift down vertical and right horizontal. When a piece of dirt lands on a printing plate it can be moved or changed due to the continued process of printing. Here are three examples of what is obviously the same flaw but each is different. I have placed them the way I think they may have occurred but can not be sure this is correct. 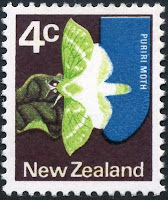 1970 Pictorial 4c Puriri Moth with inverted wing veins (dark green). 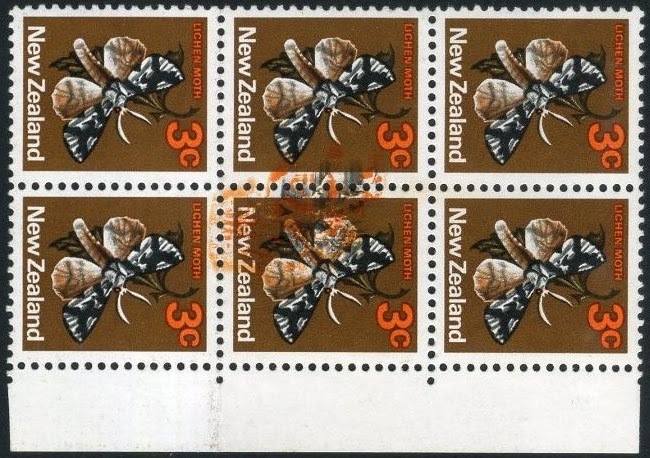 This was actually a very common problem with this stamp, obviously a large number of sheets got printed like this and were not noticed. 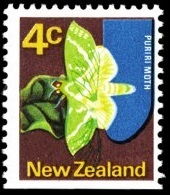 Left hand stamp - 1970 Pictorial 4c Puriri Moth with yellow colour omitted. 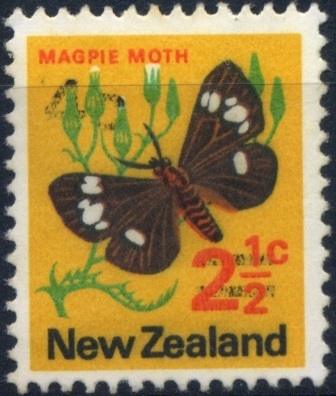 Right hand stamp - 1970 Pictorial 4c Puriri moth Purple brown colour omitted. Its amazing just how much one colour missing has effected this stamp. 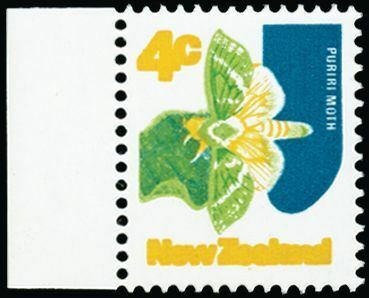 1970 Pictorial 4c Puriri Moth Greenish blue (background) omitted on the left hand stamp. 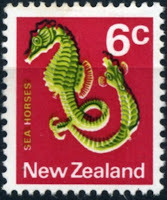 The right hand stamp is a normal example for comparison. 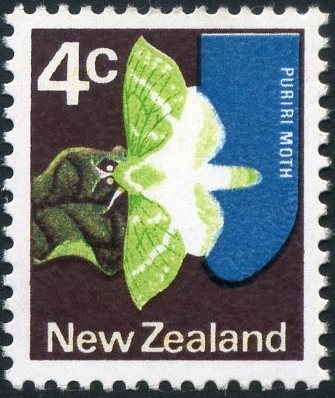 1970 Pictorial 4c Puriri moth with the light Apple-green (wings) omitted. Again there is a normal example on the right. Now this is something very rare, a full sheet of 200 (approx. half shown) with a printing error. 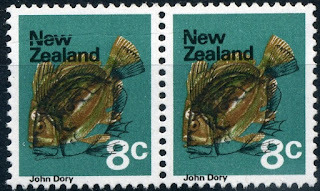 In this case its not a large one, just an upward shift of the blue but in a big block like this you must admit it does look impressive. 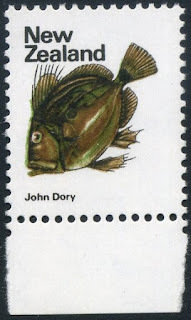 5c - Scarlet Parrot Fish. 1970 Pictorials - A 1976 commercial cover, registered at Te Hapara, with two 5c Scarlet Parrot Fish and one 30c Mount Cook National Park stamps. 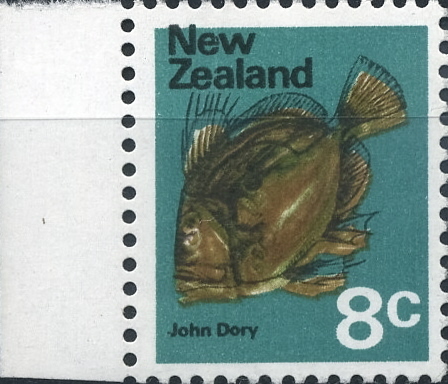 What is of interest to us here is that one of the 5c stamps has nice dark blue shift upwards, raised ghost, eyes, fins etc. Below is a enlarged detail showing this error in the stamp concerned on the left. 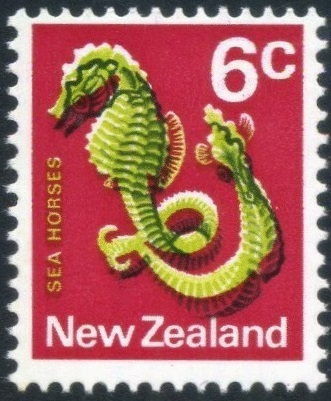 Left hand stamp - 1970 Pictorial 6c Seahorse with olive green & yellow omitted. 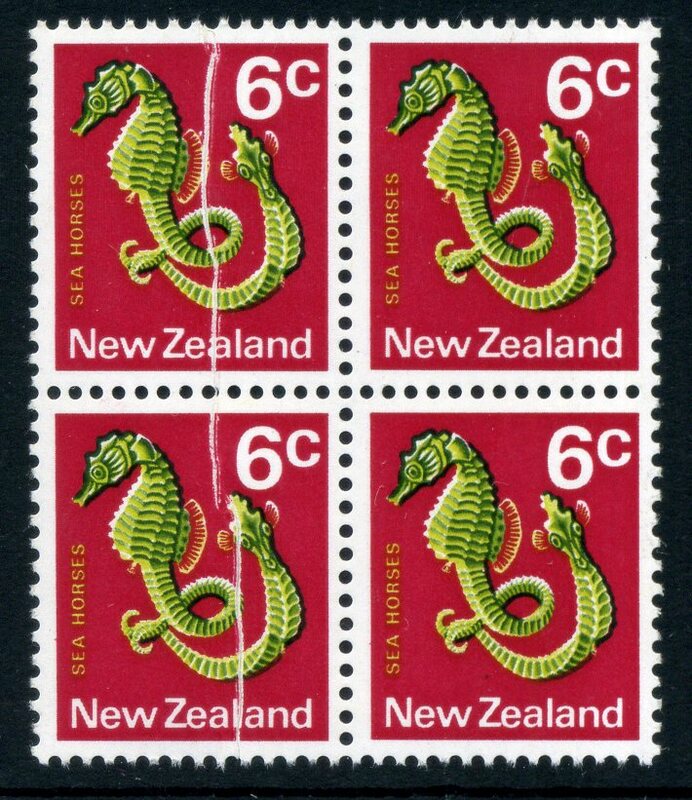 Right hand block - 1970 Pictorial 6c Sea Horses block of four with major pre printing paper crease through the left vertical pair. 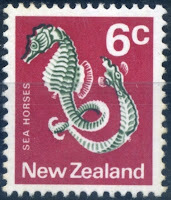 Left hand stamp - 1970 Pictorial 6c Seahorses with a dark green colour shift downwards. Right hand stamp - 1970 Pictorial 6d Sea Horse with dark green colour shift showing a key line around the right-top edge of the seahorse where the green have overlapped the red, with a white gap under the head and tail. 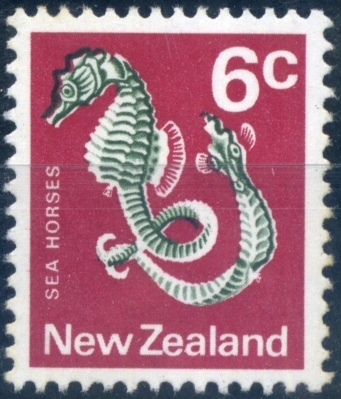 Any flaws in this stamp must be considered as being very rare as not many examples have been discovered. This might be due to two reasons:- First particularly good printing of this stamp produced few errors. 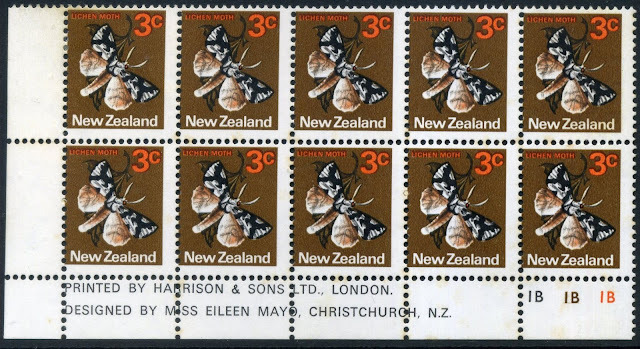 Secondly the unusual value meant less of this stamp were produced in reprints. Left hand pair - 1970 Pictorial 7½ Garfish, a rare major shift of the biscuit-brown colour up & to the left. 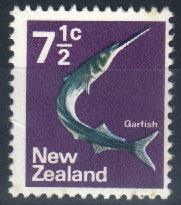 Right hand stamp - 1970 Pictorial 7½ Garfish, a minor shift of the purple base colour creates a white frame to fish. 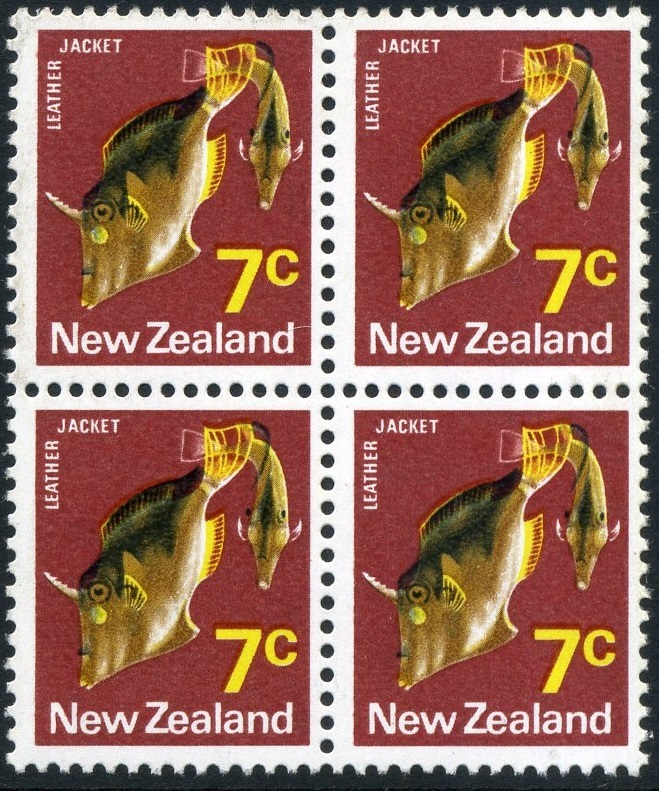 7c - Leather Jacket Fish. 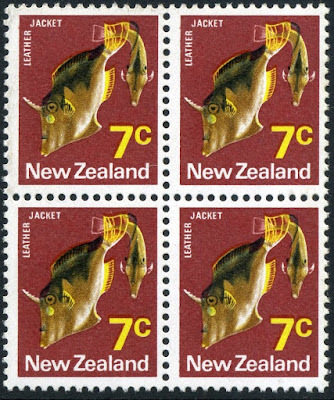 Left hand block - 1970 Pictorial 7d Leather Jacket with a very large yellow colour shift. 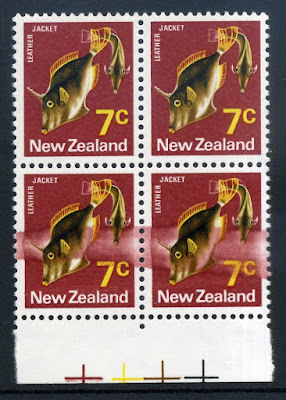 Right hand block - 1970 Pictorial 7d Leather Jacket, the red plate has a cleaning fluid run that has partly removed design. 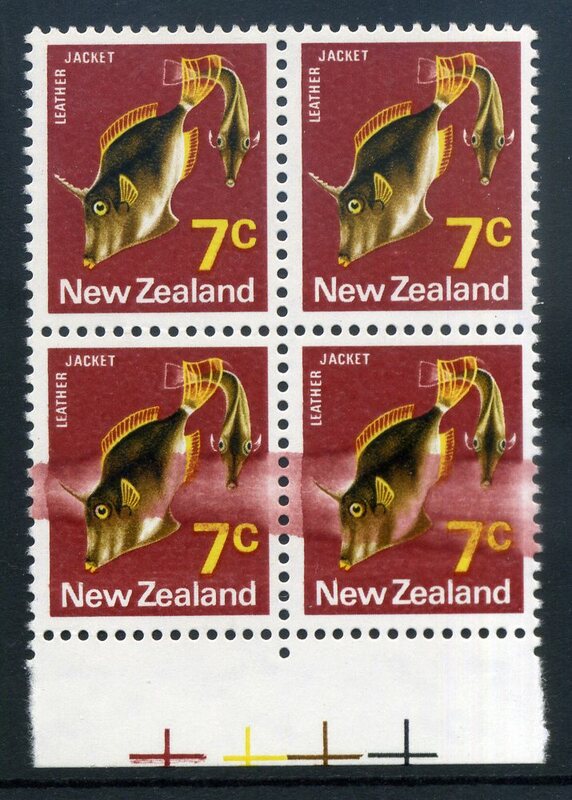 1970 Pictorial 7c Leather Jacket block four with a black upwards shift. 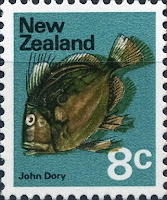 It is most noticeable with the fish now having a 2nd eye. 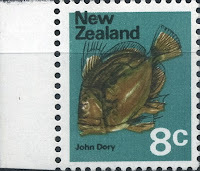 Left hand stamp - 1970 Pictorial 8d John Dory with the black 'skeleton' shifted upwards. 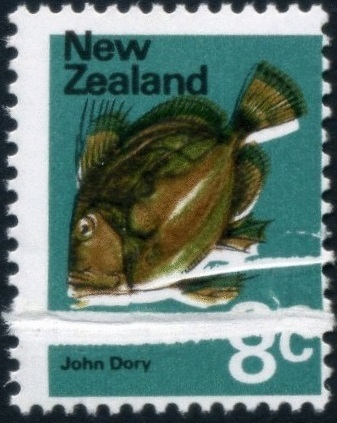 Right hand stamp - 1970 Pictorial 8d John Dory with the black 'skeleton' shifted downwards. Left hand stamp - 1970 Pictorial 8d John Dory with the blue/green background shifted up. 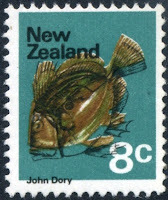 Right hand stamp - 1970 Pictorial 8d John Dory with the Olive-brown shifted to the right. 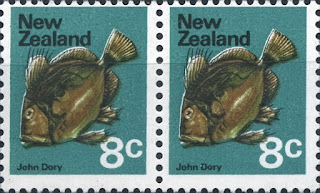 1970 Pictorial 8c John Dory, major black colour shift downwards plus paper crease in NEW of New Zealand on the left stamp. 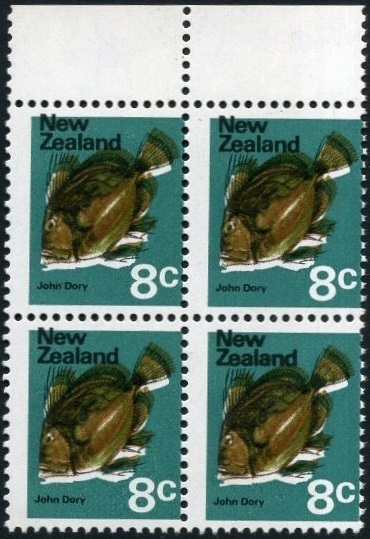 Left hand block - 1970 Pictorial 8c John Dory Fish, with a treble error. The black has shifted up and the blue/green has shifted down but also the perforation has shifted too. Now look at the example to the right and the example below. See how the perforation is similar there too, that makes me think all three of these examples that may have come from different locations on the same sheet. 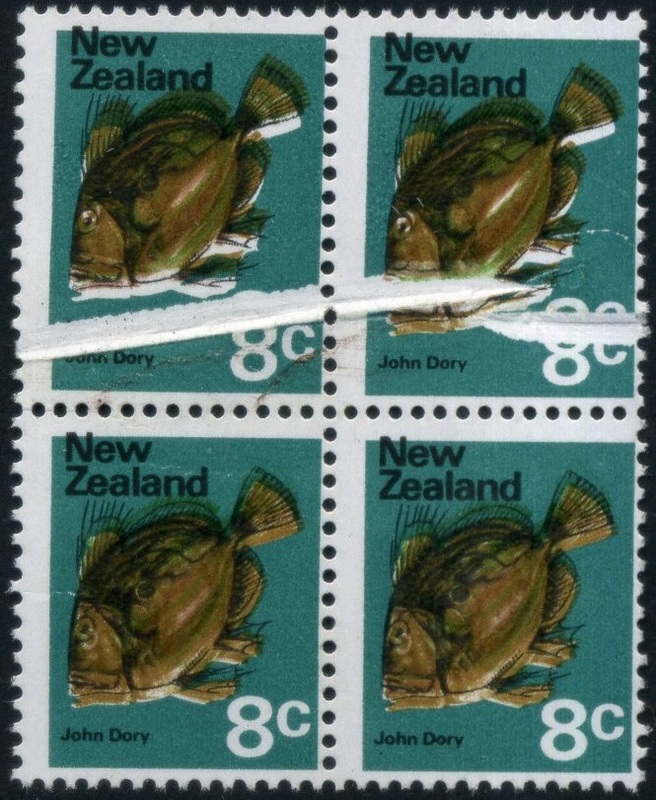 Right hand block - 1970 Pictorial 8c John Dory with a pre printing crease in the top pair. 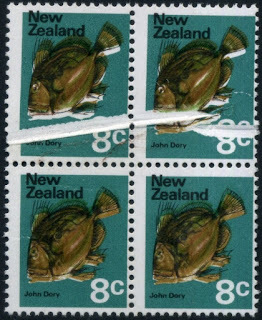 1970 Pictorial 8c John Dory Fish, with a major pre printing paper crease. The most obvious effect is the ugly white mark through the design but also notice it has caused colour shifts in the fish as well. 1970 Pictorials 8c John Dory Fish, background blue green colour omitted. 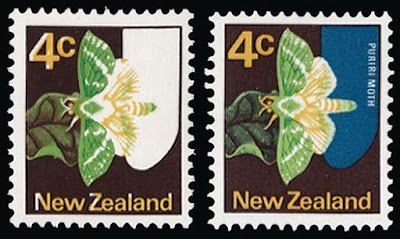 Provisional - 4c overprinted on 2½. 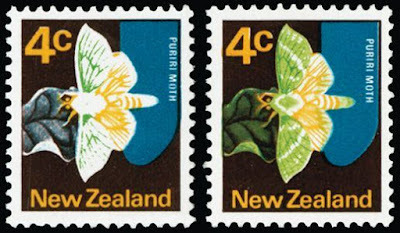 The 2½ cent stamps were surcharged in 1971 when postal rates increased and are usually listed under the 1971 Provisionals issue. 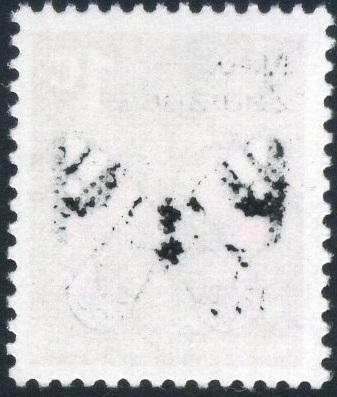 There are three varieties of this overprint which are more fully explained at the bottom of Part Two. Here was only intend to look at flaws and errors. Left hand stamp - 1970 Pictorial 2½ Magpie Moth 4c overprint, showing the 4c overprint virtually omitted. 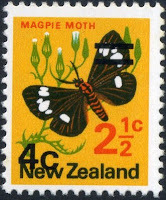 Right hand stamp - 1970 Pictorial 2½ Magpie Moth 4c overprint, where the overprint has shifted upwards 15mm so the 4c is now at base partly covering 'New', while the bars are at top over the wing of the moth. 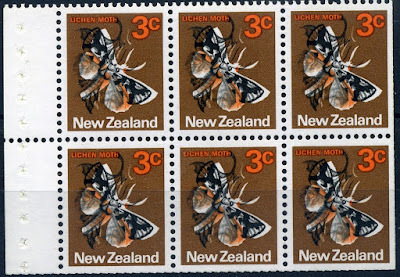 1970 Pictorial 2½ Magpie Moth 4c overprint have a huge shift downwards, so now the black bars cover the letters 'land' in New Zealand and the 4c value is hard to see because it blends with the dark colour of the moth. Back to Part Two. Forward to Part Four.